Whose lot is this I think I know. The owners are in another part of town, though. Too early for the lot to fill up with snow. In this, the short month of the year. 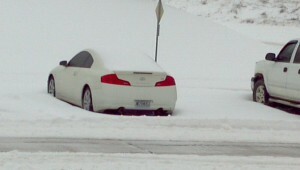 It blends into the blowing snow. Away the product of lightning, wind and downy flake. The parking lot is slick, and deep. Upon the cot in the closet I keep. This is Winter Storm Q. Who the heck decided to start naming winter storms? And why in the name of Heaven did they think winter storms NEED names? As fans of James Bond movies know, “Q” was the guy who came up with all of the Bond gimmicks. And that’s what we’re dealing with today. A gimmick. The Philadelphia Inquirer ran an editorial yesterday noting that the United Nations World Meteorological Organization in Geneva, Switzerland determines the names for tropical storms and hurricanes. There are specific criteria for determining that a storm needs a name. It does not give winter storms names. Maybe they need to hire Bob Frost Priddy as their Snowet Laureate. Frankly, we believe Missourians can call storms like this a lot of names—and probably are. Our own Mary Farucci came in this morning to announce she had bashed in her car’s tail light on her mail box. We are too much of a gentleman to ask her what she called this storm when that happened. And we hope that she is too much of a lady to tell us. We’ve been startled by lightning and thunder mixed with the snow here at the Learfield Mother Ship, the headquarters of the Missourinet and the Brownfield Network. The news staffs are making sure all of our programs keep going out no matter how deep the snow becomes. We have the cot in the closet. Brownfield’s ace market reporter, John Perkins, has an inflatable mattress. The engineers have turned on heaters on our satellite dishes to make sure ice and/or snow buildup does not interrupt our services, incoming or outgoing. The legislature showed admirable foresight in sending people home a day early yesterday. That’s good because it means we don’t have to go to the capitol today. Heck, we don’t have to go anywhere today. Thank God for pizza and sandwich delivery folks who are willing to risk life and fenders to deliver a six dollar sandwich on days like this. Others are pushing snow off our roads and throwing tons of salt that we’ll have to get rid of in a car wash next week on the pavement. We don’t lift a toast to them often enough for what they do in times like these. Most of Missouri is going to be dealing with this winter storm in various ways. Some have referred to it as the worst winter storm to hit Missouri in two years. But it’s hard to think this will be anything like Snowmageddon of 2011. And just about everybody we’ve talked with agrees that it’s good that it’s February. It’s hard to get too discouraged on snowy days when you realize that baseball is being played somewhere today. This entry was posted in Media, People, Weather by Bob Priddy. Bookmark the permalink.